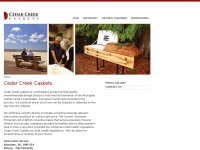 Cedar Creek Caskets is committed to producing high-quality, environmentally-benign products that meet the demands of the Aboriginal market using a sustainable, low-impact hand-made manufacturing process. The web server used by Ccreek.ca is run by CyrusOne LLC and is located in Houston, USA. On this web server 10 other websites are hosted. The language of those websites is mostly english. A Nginx server hosts the websites of Ccreek.ca. For managing the data of the webpages the CMS Joomla! in the version 1.5 is used. XHTML 1.0 Transitional is used as markup language on the webpages. To analyze the visitors, the websites uses the analysis software Google Analytics. Indexing the data of the website and following hyperlinks on it is explicitly allowed by robot information.